Tom: Brandt Snedeker. Based on this season, Brandt Snedeker will seem like a HUGE upset pick, because quite frankly, he has played like a buffoon all year. However, majors seem to bring out the best in elite players, and don’t think for a second that Brandt Snedeker is not an elite player. He followed up his 2012 Fed Ex Cup championship with a solid 2013 season, and made the cut in all 4 majors, as well as in the Masters this year, despite not having many other impressive notes. Look for Sneds to find his way back into the conversation and ignite his putter once again this week. Jon: I will be going with the young, tongue rolling (check out his face on approach shots) Jordan Spieth to take home his first major. Spieth has been in the top 25 13 out the 17 events he’s played this year. I think he got a taste of glory when he came in second at The Masters, which hopefully will spark his competitive spirit. This kid has a very bright upside, and I think the Memorial Tournament was the perfect tournament for him to prep for The Open, regardless of how he finished. Not only do I think he wins The Open, but I think this will mark a point in his career when he starts to take over Tiger’s spot as golf’s prodigal son. Dave: Matt Kuchar. I know, I know, he’s what you may think of as an ‘obvious’ choice. Thing is, he’s not. The man is coming in with 25-1 odds and that is in no way a sure thing (John Senden was 16-1 odds after 2 days at Augusta to win…that’s right, you don’t know who he is). Some other notables with these same odds are my very own Henrik “2013 MVP” Stenson, Jordan “Tiger minus the hos” Spieth and Justin “My face looks like a sock” Rose. Having finished in the top 10 at Augusta and in 9/15 tourneys this year, I believe he’s poised for a move. Kuch has been gnawing at the bit for a major trophy on his wall and I think now is time. Tom: Phil Mickelson. Even though I went with Sneds to win, I’m picking Phil here because he is the safest bet, the most likely. Yes, all the attention will be on him this week, but if there is anyone who can handle that sort of pressure, who is not missing this tournament to recover from back surgery, it is Phil Mickelson. And the craziest part is that everyone treats his record, and heart breaking six runner-up finishes in the U.S. Open as a knock against him… when in reality that means one thing, the dude knows how to get in contention in this tournament. Jon: I am also going with Phil. Until someone dethrones him, it’s hard to bet against the lefty. I think Phil’s consistency is going to be the big factor on whether or not he can win. If he can stay consistent, making par, and squeaking out a few birdies here and there, I think Phil comes away with a victory. The only knock I have against him, is because so many people are eyeing him down for this tournament, the target on his back just might be too big for him to come out on top. Still though, it’s hard to pick against the left handed shot doctor. Dave: The purest form of flattery is imitation. With that being said, I in no way want to flatter either of my associates. In what world do we live in where we put forth our prediction to win and then say that our prediction will be beaten by someone from the same country? It’s poppycock and swill that I will not drink. Matt Kuchar will cruise this week. Sidenote: I am a big fan of Lefty. I love that the guy doesn’t want to pay taxes and I enjoy, admittedly dated, rumors that he and his wife Amy are swingers. I get all that. But, Phil gets ignited when Tiger is in the hunt. With Tiger out, Phil will California Chrome on the home stretch. Tom: Matt Every. The guy played at Pinehurst in the 2005 U.S. Open as an amateur, when he was 21 years old. 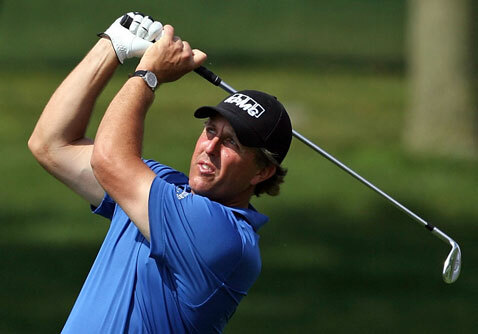 He was the low amateur and finished T-28, ahead of several top golfers, including Phil Mickelson and Lee Westwood. Fast forward 9 years and he’s having the best season of his career, getting his first PGA win in March, and notching 4 top tens and a T-12 in 2014 alone. He is also coming off of a T-3 last weekend, so he comes in with plenty of momentum. Watch for Every to make a splash this week. Jon: I was really wrestling with this. I was thinking either Patrick Reed or Kevin Stadler — and not for the player who can consume the most Funyuns on the tour. I settled on Stadler. My reasoning for this pick is not based on any tremendous stats (his three top ten finishes notwithstanding), but more the fact that Stadler has consistently been a player that I’ve watched and wished he was on my fantasy team. He’s played well this season, now it’s time to see if he can pull off the big one and win at Pinehurst No. 2. Dave: Russell Henley. That visor tho! The 25 year old has been making some serious waves this year. From his win at the Honda Classic to a half decent T-17 finish at the Players, this guy has what it takes. He is also in the top 50 for driving accuracy which should position him well in this tournament. Tom: Jason Day. Jason Day could easily make me look like an idiot and go on to win the Open here. However, he is coming off an injured thumb, and even though he battled through injury and hung on to earn a top 20 in the Masters, he simply hasn’t been playing enough golf, or playing well enough to sustain two very difficult rounds, and therefore I think he’ll get to fly home and watch the weekend on TV. Jon: I’m going with Bubba Watson to not make the cut. I just don’t think this is his kind of tournament. While Bubba has that big stick in his bag that often gives him an extra leg to stand on, I think his finesse game will lag to far behind other players, and leave him some vacation time on Saturday and Sunday. Although just by writing this, I may have solidified a B-Dubs(TM) victory. Dave: Dustin Johnson. The guy is a monster from the tee. A man after my own heart. I just don’t see him making any serious moves this tournament. After a strong start to the year, he had a disastrous Masters. Firing a 77-74 don’t make it to the weekend son. Post-Augusta, Dustin has been sheepishly trudging through the season with 1 top 10, 2 top 25s and 2 45+ finishes. The man will go out, get into some short game troubles and then go home to Paulina…we all should be so lucky. 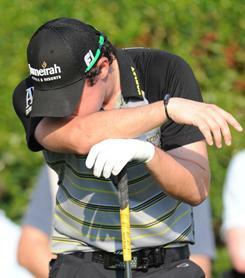 5. Who will choke harder, Rory McIlroy or Sergio Garcia? Tom: This is a tough one because they are both so good at it. My heart wants to say Sergio Garcia, but my brain is telling me Rory McIlroy. He has played some good golf despite the emotional roller coaster of calling off his wedding with Caroline Wozniacki, which prompted this creepy twitter picture, but this week causes simply too much mental frustration for Rory to not choke. Jon: I too will drink the Irish Coffee and pick Rory McIlroy to choke so hard that Wozniacki will have to launch a tennis ball into his sternum just dislodge whatever is caught in his throat. The caveat to this, is that Rory will start to prove me wrong on the first day, only to record a triple on No.5 on Friday, starting his downward journey to Choke-Haven: a place where the gators and the women have the same leathery skin. Tom’s Foursome: Phil Mickelson, Lee Westwood, Brandt Snedeker, and Charl Schwartzel. These are all relatively safe picks, save for picking Sneds to win it all. But like I said before, it is simply safer to pick “elite” players in the U.S. Open. Sure there will be unexpected names up there on the leaderboard. I considered people like Kevin Na, Matt Every, and Graham DeLaet. However, it isn’t as worth taking a gamble on these guys as it might be in other tournaments, because any golfer can miss the cut in the U.S. Open with one bad swing, so my advice is that it is better to be safe than sorry. Jon’s Foursome: Jordan Spieth, Phil Mickelson, Adam Scott, and Jason Dufner. If I could name this team anything, it would be “Team Momentum.” I agree with Tom, that it is just safer to go with the big names in The U.S. Open. It’s hard to leave off Phil and the world’s number 1 player, Adam Scott. I’ve already given my reasoning for Spieth, and I think Dufner’s poise could just get him through this thing unscathed. Is it Thursday yet? Dave’s Foursome: Matt Kuchar, Henrik Stenson, Adam Scott, Jim Furyk. I think every great team has obvious choices and some surprising ones. Kuch and Scott are safe bets for any tournament but either could take it all this week in my opinion. Stenson and Furyk are the picks I know I need to explain. On paper, Henrik should be dominating the tour but just can’t quite get back to his 2013 form. Henrik has the game, he just needs to remember to pack it on his flight from Sweden. Jimbo and his 5 Hour Energy are back! Not only did the 44 year old get me mad points last season but he has been raising some eyebrows in his finishes this season. I’m not saying go bet the farm on that Gumby swing but I think Jim could be a contender on Sunday. Remember, don’t treat others how you want to be treated, treat others how they want to be treated. Grab a seat, the game is on!